The 32.7 metre motor yacht Marhaba, listed for sale by Aldo Manns at MC Yacht Brokers, has been sold with Peter Hurzeler at Ocean Independence introducing the buyer. Designed by Joubert/Nivelt, Marhaba was built in aluminium by French yard Ocea to RINA class and delivered in 2007 with a refit in 2014. Accommodation is for up to 10 guests in four cabins consisting of a full beam master suite, VIP suite and two twins, all with entertainment centres, television screens and en suite bathroom facilities. 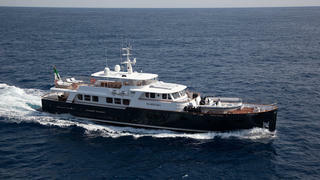 There is also accommodation for five crew in three cabins. The open plan saloon is very luminous thanks to large windows and white lacquered walls giving a strong contrast to the mahogany flooring, and there is ample comfortable seating, an entertainment centre including a 42 inch Samsung television screen and a Bose stereo surround sound system. Forward is a dining area with a teak table seating eight guests. Exterior spaces are divided into three distinct areas for guest use. The aft deck has an oval table surrounded by built in upholstered seating for al fresco entertaining and dining while on the foredeck is a settee sheltered beneath the windows of the helm station. Upstairs on the flybridge is the main area for outdoor life on board. The dimensions are worthy of larger yachts and accommodate two areas: aft is dedicated to sunbathing with chairs and couches while forward, in the area covered by a T-top, is a large dining table and the exterior helm station. Twin 485hp Caterpillar diesel engines give her a range of 4,000 nautical miles at 12 knots and she is fitted with Seakeeper gyroscopic zero speed stabilisers. Marhaba was asking €3,500,000 with VAT paid.